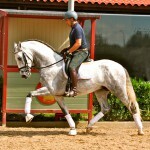 Training level: Lateral work, Excellent Walk, Good Extended Trot, Flying changes and Piaffe. 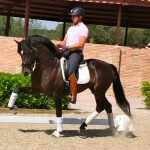 Our small Black Beauty! 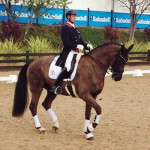 Ovalo is a very talented young horse. 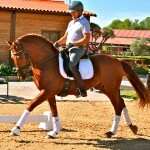 His canter in particular excels, it is uphill with super cadence and a very active hindleg. He is learning flying changes easily. 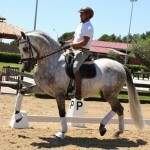 in addition shows real potential for piaffe and passage. 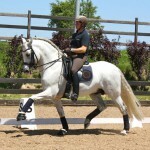 He has an excellent walk and extended trot, which will allow him to perform to the highest level in Dressage. He is fully Xrayed and Vetted, also tested Piroplasmosis negative.